Joining in with Jen at little birdie, here are my four happies for the past week. I'm working on a new crochet project. This is the first wearable item I've crocheted (aside from hats and scarves). This pattern is the Mina dress by Alicia Paulson. It's for my GB, to wear when it gets cold again (the body of the dress is a wool-blend). I have made more progress since I took this picture during the week; the bodice is now almost finished. The pattern has been a bit challenging for me, but that's a good thing. I enjoyed doing the color-striping in the yoke, using bits of leftover DK yarns; lately, I'm feeling myself drawn toward softer colors. Few things make me happier than receiving mail from foreign lands. When I was growing up, I variously had penpals in India, Sweden, Korea, Canada, Spain, France and England. Opening the mailbox to find mail addressed to me, especially from another country, was one of the greatest joys of my childhood. Even now, I am thrilled to get deliveries from overseas. This package came from China, though it seems to have been sent in collaboration with the US Postal Service somehow? I'm not sure how that works. I don't know a lot about Chinese mail. But this package contained something very simple and inexpensive which I've been denying myself for a long time, preferring to do things the hard way. It's a yarn-winder, the kind that clamps onto a table, and came to me from China for the low price of $17.99 (including shipping!). Foreign mail and easier yarny living, what more could a girl want? The summer issue of Interweave Crochet arrived in the mail this week too. I spent a happy hour perusing the patterns with my cuppa. I have to say that I don't love most of the things in this issue; they have a lot of cover-ups and tunics and lacy skirts, all of which are pretty, but I never find myself wanting to wear things like that very often. Have I mentioned that I'm not the girliest person around? Lacy, floaty clothing looks silly on me, I think. But they're pretty to look at and it's always a pleasure to read this magazine. I look forward to the new issue every season. In non-yarn-related news, I stopped by a yard sale over the weekend where the sellers had a big pile of vintage cookbooks and recipe booklets on a table. They were really fun to browse and I picked up these four to see how much they would charge for them. The sellers told me they were free! They said I could have the whole stack if I wanted them. Well, that was a very nice offer, but I didn't want to be a hog and besides, these four were the most interesting to me. They're really fun to read, and are mostly in beautiful condition. They feed my old-fashioned housewife fantasies. The Rival Crock-Pot and Osterizer blender were appealing to me because I actually own those two products, albeit models about 30 years newer than the ones the books were written for. No matter, recipes are recipes. The Mexican cookery and butter cookie booklets were put out by food companies, to help sell their products, and are quite old - both are from the early 1960's. They both have pretty nice recipes in them too, especially the cookie booklet. I'm so happy with this find. Hello and welcome, new readers and followers! I'm so glad you're here. I hope you enjoy your visits to my blog. I love to receive things in the mail... especially foreign mail! The retro cookbooks are so great... what an awesome find! Enjoy!! Once again lovely happies. I love the recipie pamphlets! 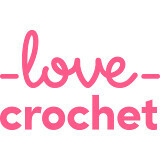 As for the crotchet project. I love the colours and the stripy pattern. Great happies! The dress looks as if it is coming along nicely and love the look of those retro cookbooks. Love the cookbooks. I was just going through some of my mom's old cookbooks recently. It was sad, but finding her notes in the margins gave me a smile. Now I know where I get it. :-) Thanks for sharing this week. I love your cookbook finds! My mother had many of these and now they are mine. Just the coloring and the styling on the pages brings back such good memories. What fun to look back and realize, as you said, that "recipes are recipes!" and they still work today. 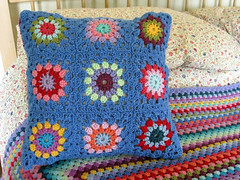 Your crochet work is so lovely. The colors are elegant, and of course, your camera takes instruction from you very well so we can enjoy your work too! A lovely bright happy week Jennifer! I think some of those fave recipes will always carry through the generations - possibly with slight adjustments here and there but nevertheless - there to enjoy! I can't wait to see the tunic when its finished. It looks gorgeous and the colours are perfect. I love old cookbooks too. I have some that my mother used plus ones I've picked up in markets along the way. As you say recipes can always be great even if they are old. Looks like you got a ton of cool things this week! I'm a total mail fan too -it's the best mid day pick-me-up to get a surprise in the mail. And that dress is looking great! Can't wait to see it finished. 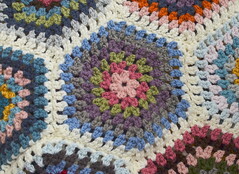 I can't crochet, so I'm looking forward to seeing that dress of yours.